Zipp Speed Weaponry has revealed details of the company's highly anticipated 404 Carbon Clincher, the first deep-profile carbon clincher design to offer the superior aerodynamics, ride quality, strength, and handling of a wide rim body. Available now through authorized Zipp retailers around the world, the 404 Carbon Clincher employs a radical new aerodynamic rim profile, dubbed Firecrest", and exclusive materials technology developed in collaboration with Zipp's composites supplier. As a result, the 404 Carbon Clincher reaches an unrivaled level of performance for clincher wheels and a total weight of just 1557 grams, putting it among the lightest deep-profile carbon clinchers available. Zipp Technical Director Josh Poertner said, "This is a product that a lot of people have been waiting for, and we wanted to give them something unlike any other wheel on the market. We spent two years optimizing our carbon clincher technology and it's probably the biggest leap forward we've ever made." To address the differences in airflow patterns between clincher tires and tubulars, Zipp engineers developed the fully toroidal Firecrest profile with a complex set of high-radius curves that adjust the width of the rim from 25.5mmm at the braking track to 27.5mm at its widest point. This wider, less tapered version of the proven hybrid-toroidal profile used in Zipp's previous clincher wheels particularly improves the aerodynamics of the rear wheel as it rotates within the frame and makes the 404 Carbon Clincher by far the most aerodynamic clincher wheelset in its class. The new rim shape also directs airflow so precisely that handling is noticeably improved. As Zipp discovered with designs like the Paris-Roubaix-winning 303 Tubular, a wider rim also increases lateral stiffness for sprinting and cornering yet offers greater vertical compliance for more control and comfort on rough surfaces. With clincher tires, the wide rim design offers even greater benefits, as the tire takes on a more stable shape that places more rubber on the road while cornering without adding rolling resistance. Increased air volume also reduces the likelihood of pinch flatting compared to narrower rims. Because clincher tires are more susceptible than tubulars are to the effects of heat buildup from heavy braking on carbon surfaces, the 404 Carbon Clincher is manufactured with a heat-resistant resin based on the materials used in motorsports brake systems. During the development process for the 404 Carbon Clincher, chemists and engineers from Zipp's composites supplier made repeated visits to Zipp's R&D lab to test and refine the new technology, which offers more consistent braking performance and prevents spikes in tire pressure on long descents. According to Jim Douglas, Zipp product manager for wheels, "The versatility and popularity of the Zipp 404 made it a natural choice for carbon clincher. The performance characteristics of the 404, combined with the functionality of our carbon clincher and Firecrest rim shape will make it a success among triathletes and road racers alike." 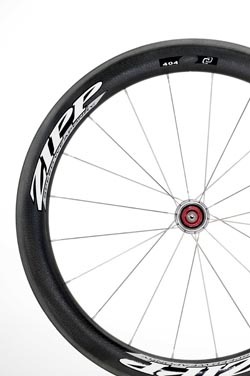 Indeed, the 58mm-deep 404 has long been a favorite of Zipp athletes for long-course triathlons, field sprints, rolling breakaways, and even mountain stages. Like all Zipp carbon wheels, the 404 Carbon Clincher uses rims manufactured in-house by Zipp, premium Sapim CX-Ray spokes (16 front/20 rear), and US-made hubs with Swiss steel bearings. Suggested retail price is $2700 U.S. per wheelset. Zipp Speed Weaponry was founded in 1988 with the sole mission of making athletes faster on their bikes. Over the course of the last twenty years, Zipp has done exactly that, by drawing on its core competencies of design engineering, composites knowledge, and wind tunnel development. It is these competencies that have allowed Zipp to deliver a series of firsts in the cycling industry. From the first carbon disc wheel to the first carbon crank to the first wheel to achieve negative drag in the wind tunnel. These firsts have helped Zipp athletes to become champions in the toughest races in the world, on the fiercest roads in the world, from the cobbled roads of Belgium to the Queen K in Kona. Zipp Wheels are handmade in Speedway, IN USA. ZIPP Speed Weaponry is raising the bar again with the New 2006 ZIPP SL Handlebar.